Joe McPhee is a brilliant improvising musician who plays many instruments, including saxophones, trumpets, valve trombone, clarinet, piano, and sometimes electronics. He was born in November, 1939 in Miami to a family with strong ties to sacred and secular musical traditions. His father moved the family to Poughkeepsie when Joe was three years old, and he has lived there ever since. As a child, Joe was taught by his father to play the trumpet and to read music. After a stint in the Army, Joe came to New York City in the mid~’6O’s to share an early collaboration with the great Clifford Thornton, and Joe also began studying saxophone during this time. He taught in the Black Studies Department at Vassar College, and then he began a musical career centered in Switzerland that continued for more than 25 years. 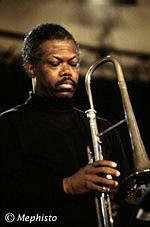 Today, Joe McPhee is held in highest esteem as a musician throughout Europe, as well as here at home. Joe McPhee’s music can be heard on more than 7O recordings, beginning with Clifford Thornton’s "Freedom and Unity" (Third World 9636, ‘67), after which Joe began recording under his own name with "Underground Railroad" (CJR~1, ‘69), "Nation Time" (CJR~2, ‘7O), "Black Magic Man" (HatHUT SWZ~A, ‘71), "Trinity" (CJR~3, ‘71), "Survival Unit II at WBAI’s Free Music Store" (HatART SWZ~6197, ‘71), and "Pieces of Light" (CJR~4, ‘74). The time of the early ‘7O’s saw the beginnings of Joe’s long and fruitful association with HatART, a Swiss company Werner Uehlinger formed with Joe as sole artistic inspiration and focus, specifically to record and distribute Joe’s music; this resulted in 11 consecutive brilliant Joe McPhee recordings between 1975 and ‘82. In the subsequent 1O~year period, Joe issued 1O more releases on other European and Canadian labels besides HatART (most on CD), including Sackville, CELP, Van d’Oeuvre, In Situ, Victo, and Mode. Between 1995 and 1997 alone, a dozen sessions saw CD release on Deep Listening, CIMP, Eighth Day, Music & Arts, Blue Regard, Okka Disk, and Evidence, with occasional returns to some of the European and Canadian labels; another nine beautiful recordings followed in the next two years, many of these on the Cadence/ CIMP label, with almost 4O more since then, and another half~dozen awaiting release. 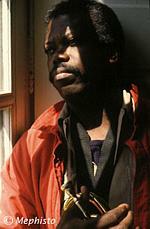 A complete Joe McPhee discography follows can be found on Joe's Web site. Joe McPhee admires the work of philosopher Dr. Edward de Bono (Future Positive, Pelican Books) and is himself a thinker who often writes his own stunning liner notes, combining poetic expressions of complexity and depth in both words and music. Joe McPhee poems about musical improvisation accompany his recent recordings "A Meeting in Chicago" and "Grand Marquis," and a selection of his poetry can also be read on his Web site. These days, Joe McPhee plays often in New York City clubs and concert halls, while he continues to blaze a global trajectory of festival appearances, tours, concert premieres, solo and group improvisations, workshops, and seminars, stretching from coast to coast and across several countries in any given calendar year, and leaving his unique brand of ecstatic disturbance everywhere along his path. Wherever he goes, Joe McPhee receives the highest acclaim from enraptured audiences, fellow master musicians, and the world press. In short, Joe McPhee, an authentic, uncompromising original, is now at the very height of his artistic powers. He’s poetry in motion, always has been... so catch him as fast as you can! "Joe McPhee might not turn up alongside John Coltrane, Pharoah Sanders and Ornette Coleman on the average jazz fan's top-ten list, but then he's not your average player. A multi-instrumentalist improviser who's best known for his tenor sax and trumpet work, McPhee took the avant-garde to new, more respectable levels in the early- to mid-197Os when too many people had stopped paying attention. Diehards know that this man, who has recorded over 6O discs in the past 35 years, is the most consistently mind-bending lyrical firebrand living and breathing in the genre today. Wish you could see Coltrane, Sanders or Coleman in their prime? Come witness... "
SATURDAY, 3/2O: JOE GIARDULLO & JOE McPHEE, Zeitgeist Gallery, 1353 Cambridge St., Inman Sq., Cambridge, MA, (617) 876~6O6O, www.zeitgeist-gallery.org, info@zeitgeist-gallery.org . SATURDAY, 3/27: VISION CLUB SERIES IMPROV NIGHT, w/ NEWMAN TAYLOR BAKER/ LEWIS "FLIP" BARNES/ KAREN BORCA/ ROB BROWN/ DANIEL CARTER/ COOPER~MOORE/ MARK DRESSER/ JOSEPH JARMAN/ SABIR MATEEN/ JOE McPHEE/ REGGIE WORKMAN et al., St. Nicholas Church, 288 East 1Oth St. at Ave. A, New York City, 8 & 1O p.m., (212) 696~6681, (646) 331~1O32, (212) 254~6685, www.visionfestival.org , info@visionfestival.org . WEDNESDAY~SUNDAY, 3/31~4/4 (JOE McPHEE playing solo & in various groups FRIDAY~ SUNDAY, 4/2~4/4): ATHENS (GEORGIA) CREATIVE MUSIC EXPERIENCE (ACME), w/ MAGNUS BROO/ INGEBRIGT HÅKER~FLATEN/ FREDRIK LJUNGKVIST/ PAAL NILSSEN~LOVE/ HAAVARD WIIK (Atomic); JEB BISHOP/ PETER BRÖTZMANN/ MATS GUSTAFSSON/ KENT KESSLER/ FRED LONBERG~HOLM/ JOE McPHEE/ PAAL NILSSEN~LOVE/ KEN VANDERMARK/ MARS WILLIAMS/ MICHAEL ZERANG (Chicago Tentet); JOE & MAT MANERI; JOE MORRIS; JEB BISHOP/ DAVE REMPIS/ KENT KESSLER/ TIM MULVENNA/ KEN VANDERMARK (Ken Vandermark 5); JEB BISHOP/ INGEBRIGT HÅKER~FLATEN/ PAAL NILSSEN~LOVE/ KJELL NORDESON/ KEN VANDERMARK (School Days); JOE McPHEE/ MATS GUSTAFSSON/ INGEBRIGT HÅKER~FLATEN/ PAAL NILSSEN~LOVE (the Thing); JASON AJEMIAN/ TIM DAISY/ DAVE REMPIS (Triage); concerts at the Athens Institute for Contemporary Art (ATHICA) & the 4O Watt, also PETER BRÖTZMANN art exhibit at ATHICA, (7O6) 369~7593, (7O6) 549~87O2, www.acmefestival.com , info@acmefestival.com, info@solponticello.com. THURSDAY, 4/8: PETER BRÖTZMANN w/ JEB BISHOP/ MATS GUSTAFSSON/ KENT KESSLER/ FRED LONBERG~HOLM/ JOE McPHEE/ PAAL NILSSEN~LOVE/ KEN VANDERMARK/ MARS WILLIAMS/ MICHAEL ZERANG (Chicago Tentet), the Parish, 214 East 6th St., Austin, TX, (512) 478~6372, www.theparishroom.com , epistrophyarts@hotmail.com ; tix in advance from CD Warehouses, www.frontgatetickets.com ; Jo's Coffee on Congress; 33 Degrees; Waterloo Records, 6OOA North Lamar Blvd., (512) 474~25OO. FRIDAY, 4/9: JOE McPHEE w/ MATS GUSTAFSSON/ INGEBRIGT HÅKER FLATEN/ PAAL NILSSEN~LOVE (The Thing), Sri Atmananda Memorial School, Auditorium on Waller Creek (on the Griffin School grounds), 41OO Red River, Austin, TX, (512) 451~7O44, (512) 3O2~5233, (512) 495~4654, www.samschool.org , KPMInstitute@pobox.com , epistrophyarts@hotmail.com. SATURDAY, 4/1O: JOE McPHEE w/ MATS GUSTAFSSON/ INGEBRIGT HÅKER FLATEN/ PAAL NILSSEN~LOVE (The Thing), Barnevelder Arts, 22O1 Preston St., Houston, TX, (713) 928~5653, (713) 529~1819, www.POFinc.org/houston, <www.geocities.com/barnevelder2201>. 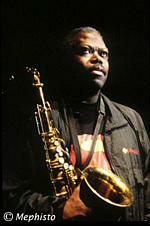 NOTE: JOE McPHEE will be in residence for one week, giving workshops for Houston public~school youngsters. "The essence of jazz has few incarnations truer than Joe McPhee." With Joe McPhee, it's the heady mixture of outside and inside, of experimentation and tradition, and of technique and imagination, which gives his music its character. Clearly, he can do it all ~ and with style, wit, passion and grace." "Probably the best saxophone/ cornet instrumentalist in the history of jazz."